The Kenya Cuisine: What Are Original Kenya Food Dishes? When talking about the Kenya cuisine, one has to remember that Kenya is made up of more than 40 different tribes, all with various histories and traditions. And several parts of Kenya also underwent other influences, such as the coast area where many centuries of Arab invasions have left their marks. These diverse influences provide a wide range of different foods in Kenya, with some dishes only popular among certain communities. The foods and dishes of Kenya cuisine are rather simple, since much of the country live in poor rural areas. There are few dishes unique to Kenya, mainly because before Kenya became an independent nation in the 1960s, tribes and communities lived and migrated around the entire eastern African region. As a result, some recipes are common also in Uganda and Tanzania. Also have a look at my pages with Kenya food recipies. Ugali is probably one of the most common foods in Kenya cuisine. It's a simple staple made from corn or maize flour and water. 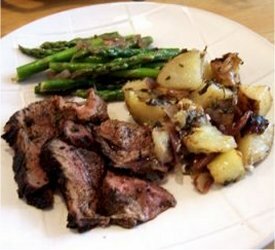 Depending on how it is being served, it can be thin like porridge or fairly stiff and doughy. Though it can be eaten with a spoon or fork, it's usually eaten by hand with meat or vegetables, like a bread. Similar dishes are known in the United States as polenta, or grits. 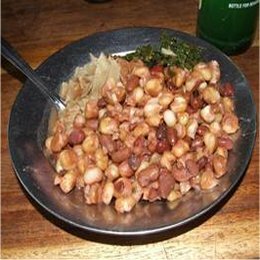 Today, Githeri can be found all through Kenya but the dish was originally eaten by the Kikuyu tribe in the central regions of the country. It's basically corn and beans, usually boiled together. It's served like a stew, usually as a main dish in Kenya cuisine. Not a specific dish, but rather a way of preparing meat in Kenya cuisine. Nyama Choma means grilled, broiled or BBQ'd meat. It can refer to any kind of meat, though its usually beef, lamb or goat. The famous Carnivore restaurant in Nairobi specializes in all kinds of grilled meats, including local game. You can find Kachumbari served as either a condiment or a side-dish. There are many specific recipes, but the general dish is made up of shredded onion and cabbage, with tomatoes and peppers. The cold vegetables are tossed in a dressing of lemon juice and coriander. Kachumbari is a common side for Nyama Choma. A sweet dish of fried dough is a popular breakfast food in many parts of Africa, including in Kenya cuisine. Mandaazi is also eaten as a dessert at other meals. It's a lot like a western style doughnut, though not usually covered with sugar or icing. The name "Sukuma Wiki" actually translates to "stretch or push the week". It's a dish used to make meals last longer. A pan of kale or other local greens if fried with onion and tomato. Sometimes it's just all simmered together in some water. For beverages, many Kenyans enjoy tea, sometimes with sweet milk. They use the term "chai" for tea, which shouldn't be confused with the Indian form of spicy tea by the same name. Kenya also has a name for the fine coffee it produces. Kenyans also drink a beverage called Maziwa Lala, made from fermented milk. Locally brewed beer (of which Tusker is the most famous) is also very popular. Because tourism is so important to Kenya's economy, cities often have many restaurants that cater to various international tastes. Resorts and large hotels usually serve European food more often than African dishes. So a visitor might actually have to search a little to find places that serve authentic Kenya cuisine.